Study abroad is often one of the most rewarding experiences in a student’s college career. A Castleton degree can take you anywhere. Read this list of employers and internship placements with which our recent alumni and graduates have had success! It will undoubtedly be an experience that you will reflect on for the rest of your life. 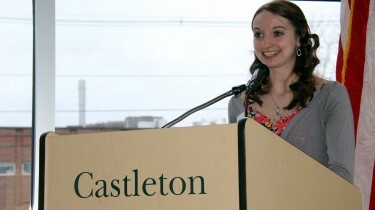 The Castleton Study Abroad Office works tirelessly to make sure that each program is safe and that all students will have one-on-one support, both at Castleton and in their host country, throughout their time abroad. As Castleton does its best to keep you safe, we expect that you will do the same. Studying abroad is a privilege. You will be expected to follow the rules and regulations of Castleton University, your host institution, and host country. Failure to follow these rules may result in immediate termination from the program and deportation from the host country, at your expense. The Study Abroad Office requires that all students studying in a country where English is not spoken as the predominate language, take at least one language course per semester. The more you are immersed in a new culture and language, the more you will learn! However, don’t let this scare you! You will be placed in a language course based on your individual level. The length of time you study abroad depends on you. The length of time you choose to study abroad may range from a few weeks over January Break to a full year. However, the longer you study abroad, the more knowledge you will gain about the culture. Sometimes studying abroad for a longer period of time can make more sense financially since one of the most expensive items in your budget will be the flight over. This means planning ahead with your advisor and your study abroad coordinator. Having a hard time choosing a program and want some advice? Make an appointment to see one of the Castleton University Study Abroad Advisors! They have all traveled extensively and can help point you in the right direction. Plan ahead! Before you settle on a location or program, sit down with your academic advisor and map out the courses that you will need to take here in order to complete your major, minor, and four frames. You will use this information to help you select a program and which courses you will take abroad. When choosing a program, you will need to make sure that it offers courses that will fit your needs. Apply for a passport, scholarships, and grants immediately! The more time you allow yourself, the easier it gets and the more money you will be eligible for! Students considering a study abroad program are strongly encouraged to take ANT 1010 Introduction to Cultural Anthropology prior to the semester abroad to better prepare for immersion in another culture, develop an understanding and sensitivity to cultural differences, and learn the practical skills of living and learning in a new and sometimes very different setting.